Michael Shaw, chairman of the Institute of Engineers presented HH with £1735 raised from their annual dinner. 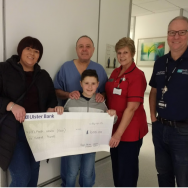 Karen Bennet and Phil Varney from the Nationwide Building Society passed on a cheque to Nigel for £916.40 which was raised at their annual dinner in the Europa Hotel last Saturday. 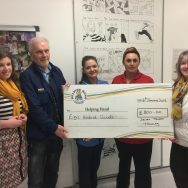 More to come from this team as they adopted HH as their charity of the year. Watch this space! A huge thank you to all. Massive thanks to Keith Telford & team for all their hard work and organising such a fantastic event! Look out for him along the way and make sure to give him your support! 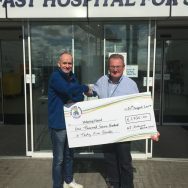 Committee members and members of the Lisburn Zone bowling club and competition sponsor Denis Wilson presented a cheque for £950 at the final event of the season which was collected throughout the seasons fixtures. What’s great effort. Many thanks.